While Halloween is a very exciting time for your children, and even for the whole family, it can also be a not-so-exciting time for your children’s dental health. 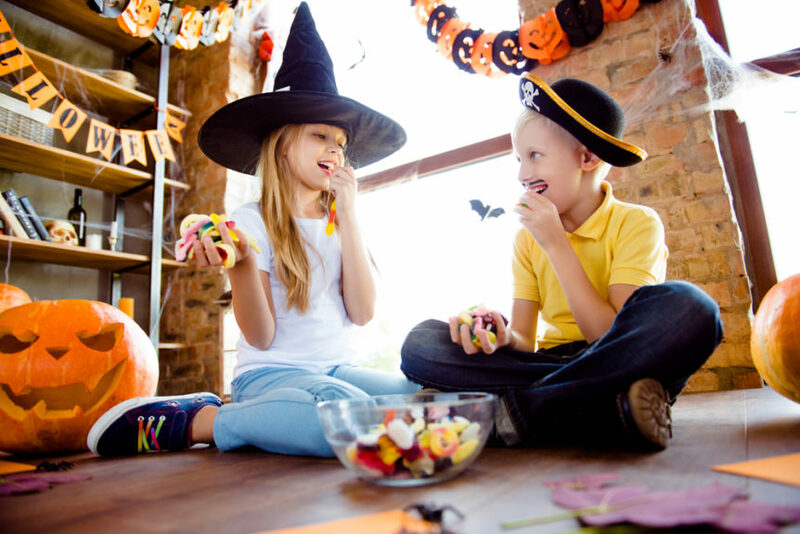 While we don’t want to deprive our kids of candy on Halloween, it is important to consider the damage that chewy and sugary candy does to their teeth. If you want to enjoy your trick-or-treat candy this year, you still can, but try following these tips as they may help you and your kids keep a healthier smile after the Halloween fun is done. The most important and easiest way to avoid dental damage is to consume less sugary sweets. Sugar is one of the biggest enemies of teeth and most prominent causes of tooth decay and cavities. Be smart and avoid eating or letting your kids eat an entire bag of candy in one night, but rather limit intake to 2 to 3 pieces each night. Not only will this help save your smiles, but your kids may be happy in that they will find their candy lasting a lot longer. Another really great tip for consuming Halloween sweets, is to make sure you do so after a meal. Not only does this help limit the frequency of consumption, but there are a few scientific factors involved as well. When we eat a meal, our mouths produce more saliva, and saliva is huge saver when it comes to preventing tooth decay. It helps to dissipate the bacteria that cause tooth decay and erosion as it works to aid in digestion and ridding your mouth of food particles. Eating candy while your mouth is in full-on saliva producing mode will help a bit in the prevention of cavities. If you can, it is best to avoid super sugary and hard, chewy candies. Said candies are typically the most dangerous for your teeth. The more sugar, the better chances of cavities, and the harder and chewier the candy, the higher the risk of cracking a tooth or destroying previous dental work in your mouth. Water is a big help for oral health, and of course overall health. Choose water that is fluoridated as it helps to prevent tooth decay. Ensure that while your children are eating their Halloween candy that you limit or completely eliminate sugary drinks, such as juices and sodas. Stick to water to help ensure better dental health for you and your family this Halloween. Another tip, and one of the most important all year round, is to make sure that you and your family are cleaning your teeth properly. You should be brushing your teeth at least twice a day, for 2 minutes, as well as flossing daily. Try and enforce healthy dental habits in your k ids from a young age to ensure they carry these traits through, saving you both time and money in the future. Also, remember the importance of seeing your dentist at least every six months for a check-up and cleaning. That includes taking your kids in to see a pediatric dentist in Las Colinas regularly as well. When it comes to a family dentist, you want to go to someone you can trust. Here at Cosmetic and Family Dentistry of Las Colinas, we can help. Come see our team of caring dentists and oral experts for an excellent dental experience. If you have any questions or would like to schedule an appointment, give us a call today.